What's The Difference Between A Square and Rectangular Asscher Cut Diamond? What’s The Difference Between A Square and Rectangular Asscher Cut Diamond? Asscher cut diamonds were first introduced to the world in 1902 by the Asscher Brothers of Holland, who at the time were well known for having cut the world’s largest rough stone. The cut was popular in the 1920s, however it made a huge comeback in the early 2000s. If you’re thinking of buying an Asscher cut diamond, this post will help you learn about the different trends you may see while shopping. The Asscher Cut Shape: Square or Rectangular? Asscher cuts are typically square-shaped diamonds, but rectangular Asscher cut diamonds do exist as well. Whether loose or set, the asscher cut is a beautiful diamond. Square-shaped Asscher cuts have a 1.00 length to width ratio, while the rectangular Asscher cut diamond has a length to width ratio greater than 1.05. The corners on both of these shapes are cropped, so the actual shape looks more like an octagon than a square or rectangle. This makes this stone more durable than other cuts, since you will be less likely to snag the diamond’s cropped corner. Both the square and elongated Asscher cut diamond are prone to show inclusions because of the large facets. However, they are more visible in rectangular diamonds than squares because of the elongation. The color is often more noticeable in rectangular cuts as well, especially if the stone is over 1.5 carats. Because of this, it is important to consider both the clarity and color grade when looking for an Asscher cut diamond. Many people confuse the Asscher cut diamond with an emerald cut diamond. The rectangular Asscher cut diamond looks quite similar to an emerald cut, but they are not identical. The Asscher has larger step facets, a higher crown, and a smaller table than the emerald cut. A true emerald cut will also have a much larger length to width ratio than even a rectangular Asscher cut diamond. Although a square or rectangular Asscher cut diamond is beautiful in any setting, there are some that are trendier than others right now. Asscher diamonds sparkle and shine on their own, so many women choose a solitaire square or rectangular Asscher cut diamond. The cut is so beautiful, it stands strong on its own, and doesn’t need an intricate band or side stones to make a statement. 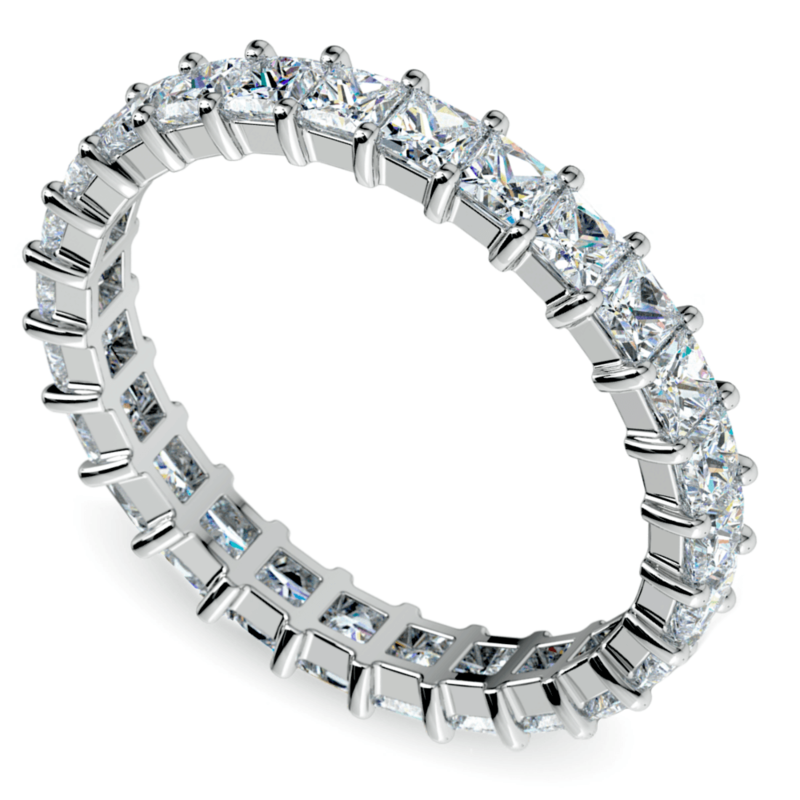 But some women who want a little extra bling go for a center Asscher cut diamond with a band featuring micropavé diamonds. 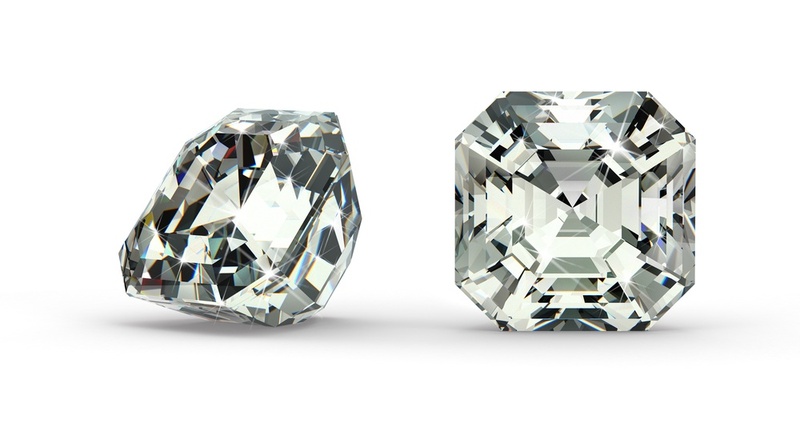 The shape of the Asscher cut diamond you decide on will also impact what setting looks best. Both square and rectangular shapes are trendy, depending on what kind of style you have. Square suits ladies who love classic and traditional looks, while rectangular diamonds are for elegant ladies who love luxury. Rectangular Asscher cut diamonds work well in a setting with baguette diamonds, while square Asscher cut diamonds are the perfect complement to a halo setting. Both versions of the Asscher cut also work particularly well in Art Deco vintage style rings, giving a throwback to the era when they first gained popularity. Vintage designs are trending extremely well these days and would make an excellent choice for anyone interested in an Asscher diamond. Although these are the current trends, it’s important to focus less on what’s popular and more on picking the diamond that best reflects your style and personality! Any Asscher cut you choose is a safe choice, since this cut will definitely be around for decades to come.